Ohlins have designed 43mm conventional/RWU forks for the special/custom bike builder who wants all the advantages of modern high-quality suspension - but classic style. 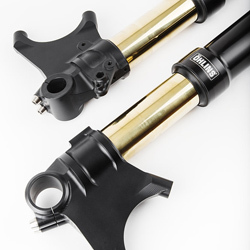 Available in traditional Öhlins gold as well as black, the technology used in these fully adjustable forks has been ­well proven through the years and works for a range of different applications. The top cap provides spring preload as well as rebound adjustment in each leg separately - compression damping can be varied via the lower adjuster. The fork bottoms come without brake ­caliper and mudguard/fender brackets - this enables the fork to be easily adapted to various models and allows the bike builder full freedom of choice. Please call us here at HPS, on 01773 831122, if you have any questions about these forks or any other aspect of improving you bike's suspension and we'll be very happy to advise. !suspension, fg620, fg621, fg 620, 621, zx-10r, 10r, zz-r1400, 1400, gixxer, gixer, gsx-r1000, 1000, yzf-r1, r1, 06, 07, 08, 09, 10, 11, 12, 13, 14, 15, 16, 17, 18, 19, 20, 2006, 2007, 2008, 2009, 2010, 2011, 2012, 2013, 2014, 2015, 2016, 2017, 2018, 2019, 2020! 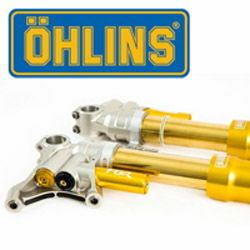 The FGRT200 Road & Track Front forks from Öhlins are the latest improved version of quite simply a design and perfomance classic. It doesn't matter whether you're are heading for a national road racing title or taking your bike to the local café... these forks will provide improved performance, stable damping characteristics combined with fantastic comfort. The 30mm cartridge system features easy compression damping adjustment on one leg, with rebound damping on the other. 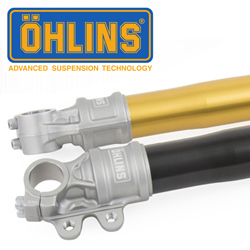 Featuring the race proven technology of Öhlins' 30mm front fork cartridge kit, the compression and rebound damping adjuster mechanisms are separated between the fork legs to not only allow for superior dynamic behavior, but also to position the adjusters conveniently on the top of each leg. Your new forks will improve rider feedback, feel/control under braking and general handling of you bike, not to mention display exquisite styling. 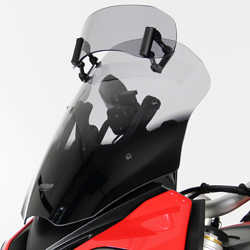 The FGRT 200 Series; a perfect design in terms of both performance and appearance. 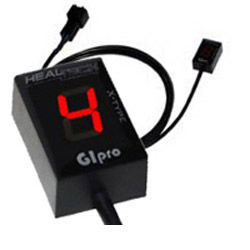 !suspension, 201, 202, 203, 204, 205, 206, 207, 212, 210, 211, 212, 213, FGRT201, FGRT202, FGRT203, FGRT204, FGRT205, FGRT206, FGRT207, FGRT212, FGRT210, FGRT211, FGRT212, FGRT213, sp, zx-10r, 10r, zz-r1400, 1400, gixxer, gixer, gsx-r1000, 1000, yzf-r1, r1, 06, 07, 08, 09, 10, 11, 12, 13, 14, 15, 16, 17, 18, 19, 20, 2006, 2007, 2008, 2009, 2010, 2011, 2012, 2013, 2014, 2015, 2016, 2017, 2018, 2019, 2020! It doesnt matter if you are heading for a National Roadracing title or if you are taking your bike on a run on your favourite road. The new Road & Track front fork will give you loads of performance, stable damping and fantastic comfort. The new Road & Track front fork features the Öhlins 30 mm Cartridge Kit inside, a winning kit in several national superbike championships. !suspension, ohlins, sp, fgrt300, 11, 12, 13, 14, 15, 16, 17, 18, 19, 20, 2011, 2012, 2013, 2014, 2015, 2016, 2017, 2018, 2019, 2020! Using technical solutions and experience gained from many dominant championship-winning seasons in MotoGP, World, British and AMA Superbikes, Swedish brand Öhlins Racing has yet again improved upon its world beating FGR series forks to create the most advanced fork on the market - the TTX-25 FGR 300 - the very essence of advanced suspension fork technology. Öhlins understand that just because your product is dominating race tracks the World over that doesnt mean it cant be made better and in racing development never stands still - and neither does Öhlins' tireless Research and Development team. So, faced with the incredibly challenging target of improving the already hugely acclaimed predecessor FGR front forks, Ohlins engineers set out to better the best. Öhlins technicians reinforced the outer tubes to make the FGR 300 forks stiffer and more robust while increasing their ease of use by colour coding the compression and rebound adjustment wheels (a simple design modification that saves vital seconds and helps eliminate mistakes in the high pressure world of racing). a set-up that is trusted by the worlds best! Not designed for road use, please note these forks may require more regular maintenance by an Öhlins experienced technician than a bikes regular/OE forks. 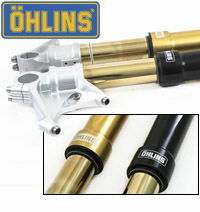 Click here to download the Öhlins FGR 300 owners manual. !suspension, ohlins, sp, fgr300, fgr-300, zx-10r, 10r, zz-r1400, 1400, gixxer, gixer, gsx-r1000, 1000, yzf-r1, r1, 06, 07, 08, 09, 10, 11, 12, 13, 14, 15, 16, 17, 18, 19, 20, 2006, 2007, 2008, 2009, 2010, 2011, 2012, 2013, 2014, 2015, 2016, 2017, 2018, 2019, 2020!